An indoor bridal shower scavenger hunt can be the perfect way to get your guests to mingle and loosen up. The list below consists of a few things that not all guests may be comfortable with, so feel free to change it to suit your bridal shower. Divide your guests into teams if you have enough and see which team can come up with the most items on the list below. Two of the items are good for tie breakers... the anniversary one and the lipstick one. If you don't have many guests, give each one a copy of the list and have them go around and get signatures beside the items. Whoever completes the list first or whoever has the most items found in the allotted time wins. 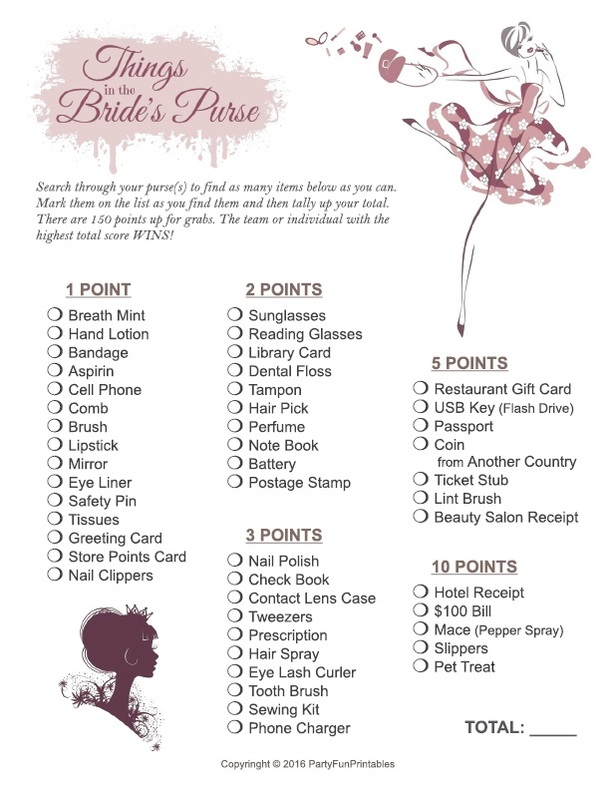 Handbag Hunt / Bridal Shower Scavenger Hunt - A free printable purse scavenger hunt. Clean Bachelorette Scavenger Hunt - A fun girls night out before the wedding scavenger hunt list.